Are you in need of solutions for your Missing Teeth or Loose Dentures? Dental implants come in different shapes and sizes. Springfield Family Dental offers a variety to best meet your needs and fit in your budget. Both traditional dental implants and mini dental implants can allow you to throw away your dentures and get your teeth back. Payment options are available to help finance your dental procedures. Contact our office to schedule your consultation to discuss your options. Suffering with broken, damaged or missing teeth? Then mini dental implants in Springfield, VT may be just what you need to achieve that perfect smile. At Springfield Family Dental, serving Springfield, Vermont, we offer the most technologically advanced dental implant procedures available. The process of Dental implantation involves many factors. One of the most crucial ones is to choose the right Mini Dental Implant Dentist, and you can find that right here at Springfield Family Dental. With our advanced dental technology, we offer patients in the Springfield area the very best when it comes to dental prosthetics. Quality service at a great price, what more could you ask for? Many men and women live daily with imperfect smiles. Why continue to suffer when there is an economically viable option out there for achieving the smile you've always wanted? Dental Implants in Springfield, VT give patients the dual advantage of stability and the appearance of a real tooth. Just think, how fantastic would it be to be able to chew normally and have a beautiful smile? Mini dental implants in Springfield are a great way to achieve a natural looking smile. Implanting the prosthetic into your jaw bone, giving the appearance that the artificial tooth is growing naturally from your gum, does this. A dental implant is nothing but an artificial tooth that replaces a natural one, but with the technologically advanced implants at Springfield Family Dental, we create a natural smile with implants that act as your real teeth. When the implant is attached to your jaw, it binds with your bone and becomes permanent. Implants remove the distress of removable dentures, which tend to shift, causing irritation. In addition, the way they fit into the mouth can often pose problems while conversing with someone, or while trying to chew foods. But implants will never loosen or move around. They will always remain secure and in their right place. The advanced dental implant technology makes replacing even a single tooth possible, because they do not rely on surrounding teeth for support. Unlike dental bridges, which rely on adjacent teeth for anchoring, dental implants support themselves. By securing the implant firmly into the jawbone, there is little risk of the implants falling out. They will look and act as normal teeth—once they are in, you'll never have to worry about them again. 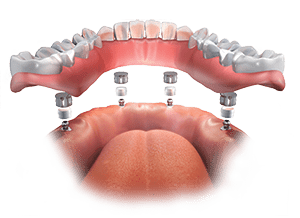 Implants also provide other major advantages over other dental prosthetics, including improved speech, enhanced appearance, greater comfort, easier chewing and increased self-esteem. If you are tired of living with an imperfect smile and are ready to get beautiful, natural looking teeth, visit Springfield Family Dental today and find out how mini dental implants in Springfield, VT can help you to look and feel your very best! If you think dental implants or mini dental implants may be the solution you've been looking for to replace missing teeth or to secure loose, uncomfortable dentures, contact Springfield Family Dental today.